This year’s 44th edition of the Seattle International Film Festival revealed today the complete lineup of 433 films, plus guests and events for the 25-day Festival that runs May 17 to June 10, 2018. Opening night kicks off Thursday, May 17 with The Bookshop from acclaimed Spanish filmmaker Isabel Coixet (Learning to Drive, Elegy), distributed by Greenwich Entertainment. The film is set in a seaside village in England where a grieving widow (Emily Mortimer) pursues her lifelong dream of opening a bookshop. She introduces the townsfolk to the world’s best literature and stirs a cultural awakening, but her efforts are ruthlessly opposed by a powerful local (Patricia Clarkson) causing a reclusive resident (Bill Nighy) to join the fight to keep the bookshop open. The film is based on the bestselling novel by Penelope Fitzgerald. The Seattle premiere of Ethan Hawke’s Blaze will also screen at the historic SIFF Cinema Egyptian as SIFF honors Mr. Hawke’s work with the Award for Outstanding Achievement in Cinema. In addition to the award presentation and screening, the acclaimed actor is slated for an on-stage interview at the Friday, June 8 event. Also scheduled is An Afternoon with Melanie Lynskey, where the Festival pays tribute to this celebrated actress. The iconic scene-stealing actress makes her way to SIFF on Sunday, May 27 for the Seattle premiere of Northwest Filmmaker Megan Griffiths’ film Sadie with an onstage discussion following the film. 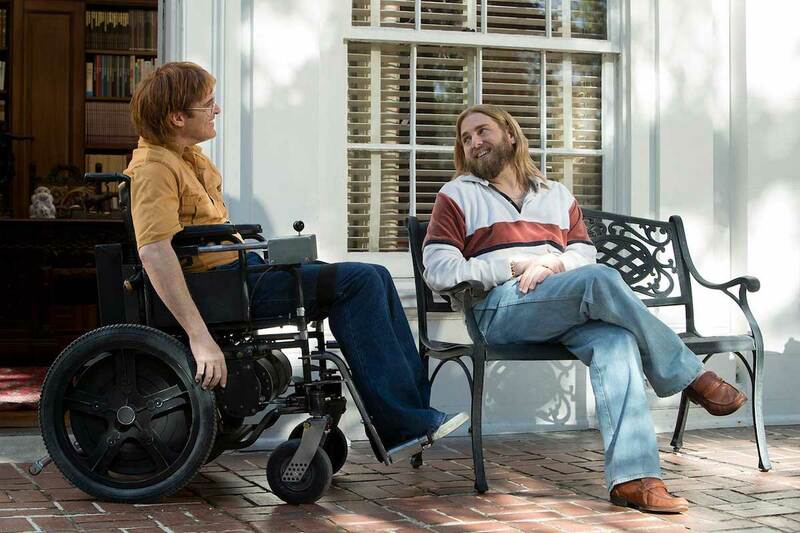 Seattle favorite, Gus Van Sant’s Don’t Worry, He Won’t Get Far on Foot, closes SIFF 2018 with a bang! Starring Joaquin Phoenix in a transformative performance as Portland cartoonist John Callahan who, after a car accident leaves him disabled, uses his sardonic humor and brutal honesty to battle with a lifetime of addiction. Spanish director Isabel Coixet heads to the English coast circa 1959, where a headstrong widow (Emily Mortimer) opens a bookstore in a sleepy village and encounters both pride and prejudice from the provincial locals. Winner of Best Film, Director, and Screenplay at Spain’s Goya Awards. Lakeith Stanfield, Tessa Thompson, and Armie Hammer star in the exhilarating directorial debut of musician Boots Riley, a biting and bonkers satire that follows a black telemarketer who discovers an unknown skill which gives him magical selling powers that shoot him up the corporate ladder. Joaquin Phoenix gives a transformative performance in Gus Van Sant’s sensitive and caustically funny portrait of Portland cartoonist John Callahan who, after a car accident leaves him disabled, uses his sardonic humor and brutal honesty to battle with a lifetime of addiction. The outstanding supporting cast includes Jonah Hill, Rooney Mara, Jack Black, and musician Beth Ditto in her impressive film debut. Since making her debut at age 16 opposite a young Kate Winslet in Peter Jackson’s Heavenly Creatures, the New Zealand-born Melanie Lynskey has become one of American cinema’s most reliable character actors. From Ever After: A Cinderella Story to Shattered Glass, The Informant! to The Perks of Being a Wallflower, Hello I Must Be Going to I Don’t Feel at Home in This World Anymore, and TV work ranging from HBO’s “Togetherness” and “Animals” and Cartoon Network’s “Over the Garden Wall” to 12 years on CBS’ “Two and a Half Men,” her passionate dedication to her craft has created a class of charismatic characters defined by their grace, sensitivity, quirkiness, and kindness. This afternoon, SIFF will welcome her to the stage for an interview featuring film clips from her career, followed by a screening of one of Lynskey’s latest films, Sadie, directed by Seattle-based Megan Griffiths (The Night Stalker, Lucky Them, Eden), with music by Pearl Jam’s Mike McCready. There will also be an opportunity for audience questions following the screening. A modern day renaissance artist, Ethan Hawke’s creative talent continues to flourish in several realms of expression. An actor, screenwriter, novelist, and filmmaker, his body of work is broad as it is deep in a career that now spans three decades. From portraying a rock-steady police sergeant and cowboy, to a sensitive teenage poet and young heartthrob, his versatility as an actor is renowned, cementing him as one of the great performers of this generation. SIFF will present Ethan Hawke with the Seattle International Film Festival Award for Outstanding Achievement in Cinema. A Q&A with Hawke will follow the screening of his new film, Blaze. Past honorees of the SIFF Outstanding Achievement Awards include Anjelica Huston, Laura Dern, Chiwetel Ejiofor, Viggo Mortensen, Kyle MacLachlan, Sir Ben Kingsley, Kevin Bacon, Edward Norton, Sissy Spacek, Joan Allen, Spike Lee, among others. Based on a true story, the directorial debut of popular Swedish personalities Filip and Fredrik is an outrageous, unconventional comedy set in the 1980s about an eccentric resident of “the most boring town in Sweden” who decides to put his sleepy hamlet on the map by assembling the world’s longest layer cake. Oscar®-winning director Morgan Neville (20 Feet From Stardom) presents the heartwarming life of Fred Rogers, whose cherished PBS series, “Mister Rogers’ Neighborhood,” used cardigans, puppets, and the Land of Make-Believe to imaginatively and compassionately inspire children, while not shying away from complicated issues. When a drummer for an up-and-coming Dublin rock band is diagnosed with bipolar disorder, he is forced to join a weekend mixed-ability soccer team and makes fast friends with a 17-year-old with Asperger’s Syndrome in this poignant and charming bro-com between two odd and lonely souls. Seattle rock band My Goodness bring their expansive blues-inspired sound to The Triple Door for a live accompaniment to the 1911 Italian silent film, a macabre tour de force inspired by Dante’s “Divine Comedy,” featuring ground-breaking special effects and a cast of thousands. When originally released in 1986, this franchise-inspiring fantasy adventure about an immortal Scottish swordsman featured a handful of new songs from rock icons Queen. Now, Seattle’s own DJ NicFit reimagines the cult classic with a decades-spanning all-Queen playlist performed live on two turntables. Ranging from industrial training videos to forsaken home movies, comedians Joe Pickett and Nick Prueher’s vast VHS library features the world’s largest collection of strange, outrageous, and profoundly stupid videos, the best (and worst) of which they have carefully curated and present along with live comedy commentary.